If you’ve been following our Rookie of the Week promotion and entering your card codes, you know that we’re giving out boxes of Upper Deck product to lucky fans who participate. 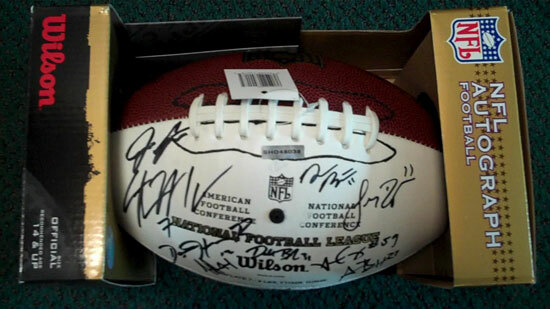 This is an NFL autograph football signed by this season’s top rookies at our photo shoot earlier in the year. And a lucky entrant will get one every week until the season ends (this is in addition to the boxes we’ve been giving out). So if you’re looking for a little more holiday cheer to come your way, make sure you enter plenty of rookie card codes for your chance to win! That’s my kind of holiday bonus. Hey, cool! I have that ball, too. It’s so sick. I never heard of this promotion but thanks for letting me know Toby. Cool!